What if, instead of simply desiring Wickham, Elizabeth’s sister Lydia also sets her sights on Fitzwilliam Darcy. Mr. Darcy makes an impromptu visit to Netherfield with Mr. Bingley. He saves Elizabeth Bennet from drowning in a lake. But things take a turn when the Bennetts plan the most expensive ball ever known in Longborough. All in the hopes of finding husbands for their daughters. Elizabeth's parents know that this is their last chance to find husbands for their daughters. Otherwise, the estate will be taken over by Mr. Collins. Lydia gets pregnant but who is the father of her child? Lydia makes accusations. Elizabeth is torn. Could it be that the man she grew to love did this unspeakable act with her sister? If Mr. Wickham's insinuations are right, then perhaps Darcy could be the father of Lydia's child. Should she have accepted Mr Collins proposal? What shame has Lydia’s actions brought to Longborough. Disgusted by the insinuation, Mr. Darcy is forced to make a choice. Clear his name and listen to his friend's sisters who say Elizabeth Bennett and her family are beneath his status in society? Marry his cousin at his Pemberley estate or fight to make Elizabeth the mistress of Pemberley? 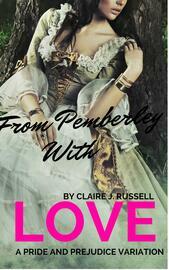 From Pemberley with love is a delightful story and a variation of Jane Austen's Pride & Prejudice. Available for pre-order at $4.99. On release day February 14th Valentine's Day, the price goes up to $6.99.